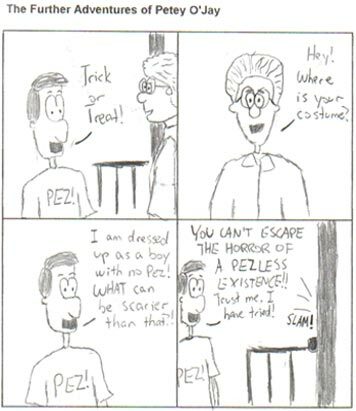 In this month's installment, Petey dons the most frightening costume of them all. "So many Pez, so little time." To the tune of "Doe, a Deer"
Bart, a Giant Simpsons treat! Hulk, the meanest Pez you'll meet! Darth, what can I say but "wow!" Bart! A Giant Simpsons treat! Hulk! The meanest Pez you'll meet! Darth! What can I say but "wow!" This song is hereby dedicated to our former Five Questions interviewer, who is now a baked potato.